That's what this shrub with white flowers is called. Last year I pruned it so that the trunks are exposed. That makes it easier to get around it with the lawnmower. This year's flowers have not suffered from the pruning. 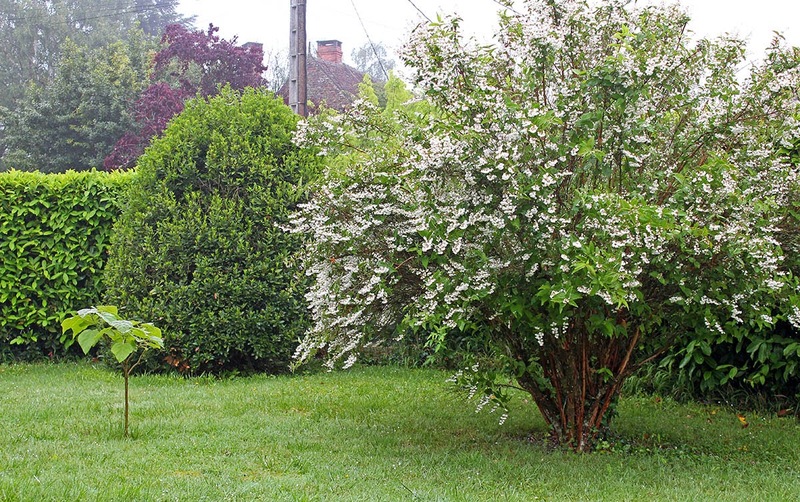 The deutzia as it begins to flower. The little tree on the left is a catalpa. The rounded shrub in the back is bay laurel; good for cooking! Once the flowering is over, I plan to cut the shrub's height down by about a third. That will complete the pruning for now. I'm looking forward to what it will look like in a year. I'll do the same with the forsythia next spring. This is what the grape vines are looking like right now. Lots of fresh new growth and little flower buds. The days are mild and we've had a lot of rain in the past week. 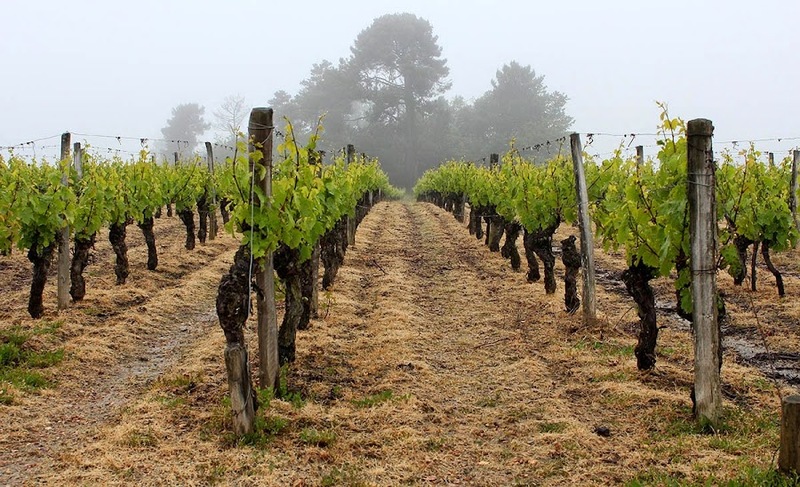 The growers use every dry day to spray the leaves against mildew. There's a long way to go until we see grapes on the vines. But I'm not in a hurry. Ken's in Paris until tomorrow and I'm using the time to get our French taxes done. Then I can do the American taxes (Americans living abroad get an automatic filing extension to June). It's graduation season! 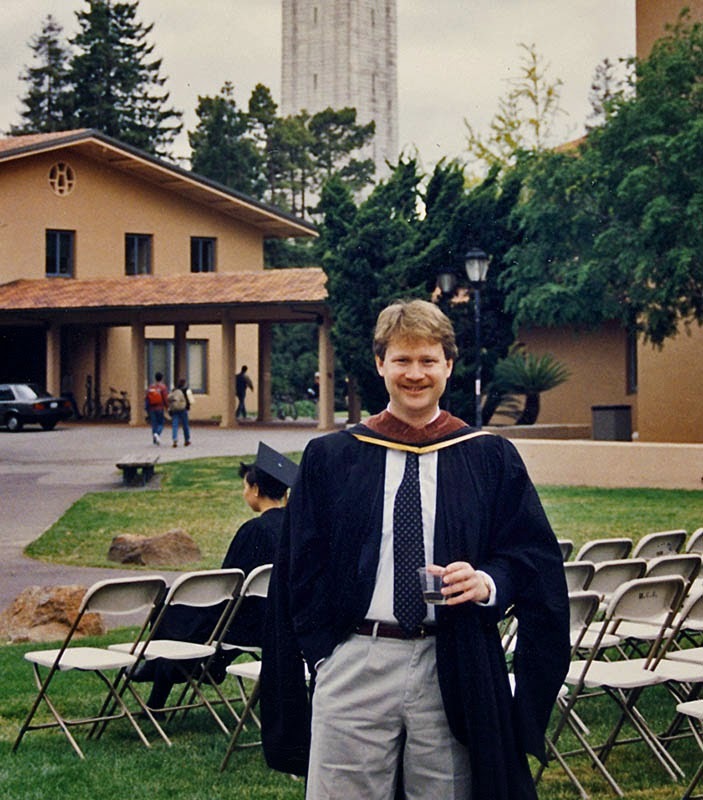 This photo was taken in the Spring of 1991, just after the graduation ceremony for my class at the University of California, Berkeley, where I got my master's degree in city planning. I'm standing just outside Wurster Hall (not in the photo) with the campanile towering in the background. The ceremony itself was held in the Greek Theater on campus. The graduate. Celebrating with a glass of wine, of course. I was 31 years old. Ken attended the ceremony along with a few other close friends. I think we had a meal at home afterward, but I can't find any photos of that. Here's another shot just as the ceremony was starting. That's me in the middle, on one of the rare occasions that I stood out among my classmates. 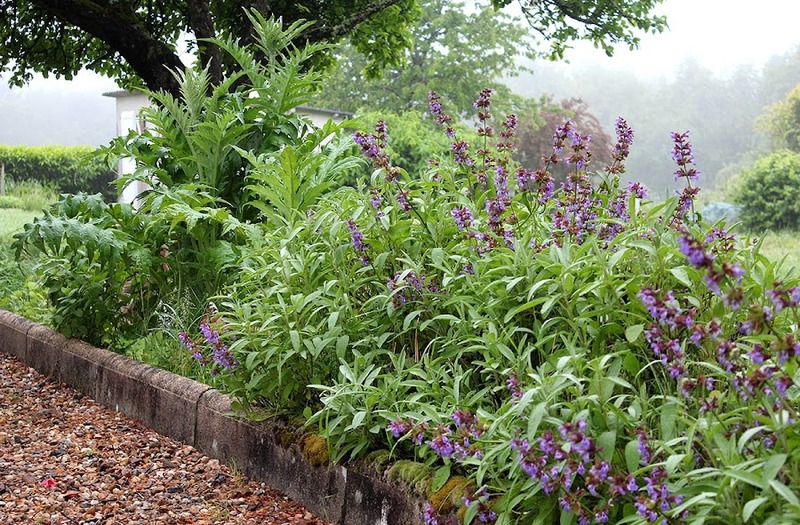 The sauge (sage) is flowering now and the artichauts (artichokes) are forming. So far I've counted three little artichokes. I planted framboises (raspberries) in April in the spot vacated by two other artichoke plants that succumbed to freezing temperatures a couple years back. The raspberry plants have a few little flowers on them. Somehow the green plants look more lush on a foggy morning. The days have been foggy, overcast, and wet of late. Thankfully we're expecting a couple of sunny days in advance of the weekend. I hope to take advantage and get the vegetable garden planted and the grass cut. Wish me luck! Remember when I made cuttings from our hydrangea and tried to root them? Well, they survived and now it's almost time to plant them outdoors. This is what they look like now. I didn't expect them to flower in the first year. We still have to dig out the plants in front of the house to make room for the hydrangeas. That will be a chore, but we'll get there. If you don't remember what these looked like back in December of last year, here's a reminder. Here are the cuttings back in December, after they had rooted for a few months. I've been making this salad for years after having seen it done on television one day. It's normally made with black radish, mimolette cheese, chervil, and oil and vinegar. This weekend I used our garden-grown white icicle radishes instead of a store-bought black radish, and I grew the chervil here as well. 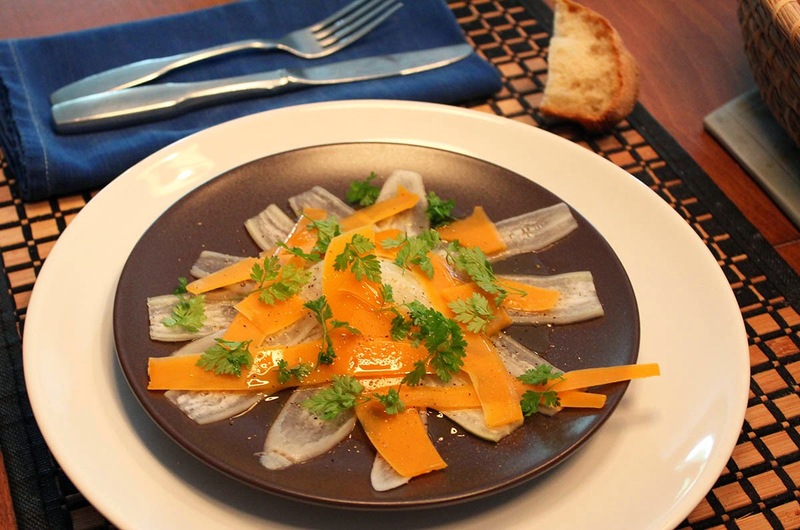 Thinly sliced radish and shaved mimolette cheese in a light vinaigrette topped with chervil. Delicious! The mimolette comes from the grocery, of course. I used sherry vinegar and olive oil, along with a good grind or two of black pepper. I also macerated the sliced radishes in salt for thirty minutes before rinsing and drying them for the salad. This dish makes a good appetizer before the main course. 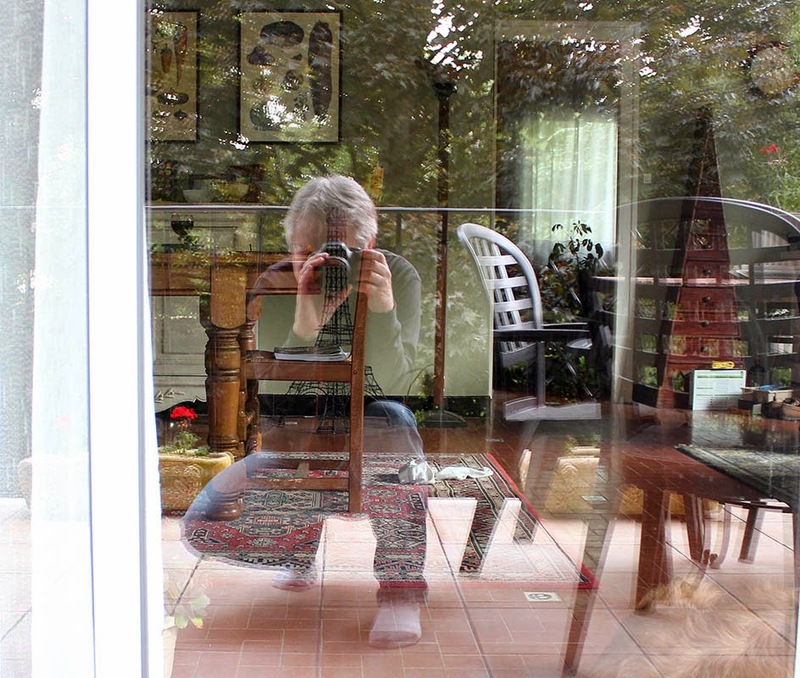 When I was taking photos of the geraniums on Friday, I took this picture through the new doors looking into the living/dining room. I'm still getting used to the doors. And I still need to wash them. Our contractor told us not to wash them right away. He said, that because they were covered in plastic when they were delivered, they still had a lot of static electricity that would just attract dirt. Best to leave them for a couple of days. I don't need much of an excuse not to wash windows. It's been more than a couple of days now. I like having geraniums in the planter boxes on the deck every year. Red geraniums are very French; you see them everywhere from spring through fall. They add intense color to every house and village and city around the country. One of three planters on the deck. These plants should triple in size by mid-summer. The geraniums I got for the kitchen window boxes are not red. They're a kind of violet color. I'll take a photo once I have them planted and they flower a little more. Between Wednesday's and Thursday's storms, we got about forty millimeters (over an inch and a half) of rain. That's nearly a month's worth in twenty-four hours. Things are going to get mighty green around here. This is part of our yard before the recent rain. The apple trees are fully leafed out. I went to the market in a nearby town yesterday because I know of two plant vendors there that have always had a nice mix of vegetable seedlings and flowers. I don't need any vegetables since I've grown my own seedlings, but I wanted some geraniums for the flower boxes on the deck and outside the kitchen window. In past years I've put surfinias (cascading petunias) in the kitchen boxes, but this year I wanted to try a cascading geranium. I was armed with the name of a geranium I saw at the blueberry farm last summer, but the woman at the market didn't have that variety. 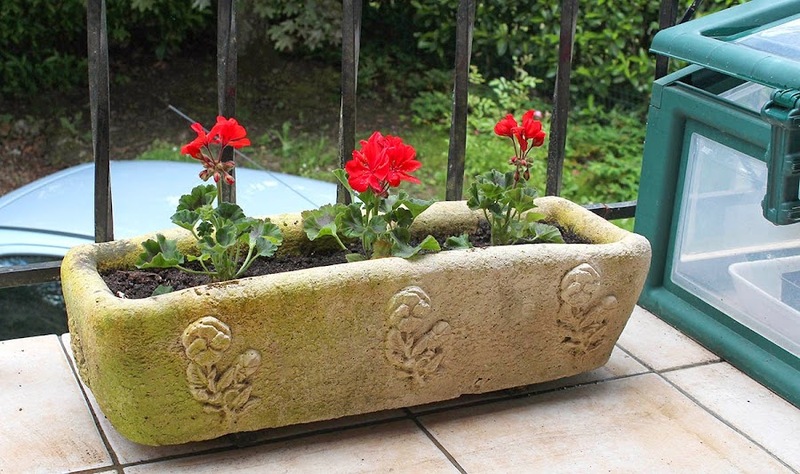 She showed me another cascading geranium that she had and I liked it, so I bought six little pots for the window boxes. I was thinking of driving up to the blueberry farm to see if they had the rozanne variety, but I didn't need to. I planted the deck geraniums yesterday. Today I'll tackle the window boxes. Another edition of Throwback Thursday. 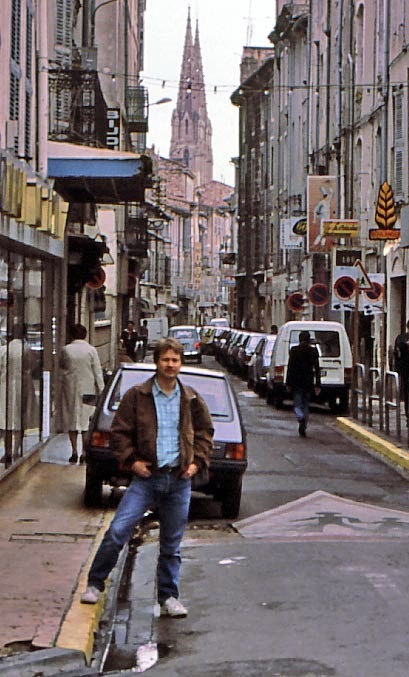 This time we're back in 1989, in the city of Nîmes. Ken took my picture on the street. This trip was special for many reasons, but I particularly remember checking into the hotel in Nîmes. When the woman checking us in learned that we were American, after listening to Ken's French, she actually took two steps backward. She was so surprised that an American could speak such good French. Straddling the gutter in Nîmes. The other memorable part of that hotel was that the room was huge, with very high ceilings. The bathroom was partitioned off, but the walls didn't go all the way up to the ceiling. Whatever you did in the bathroom was heard in the entire room. Ken posted photos of these flowers yesterday. I noticed he didn't have a photo of the blue ones, so here they are. 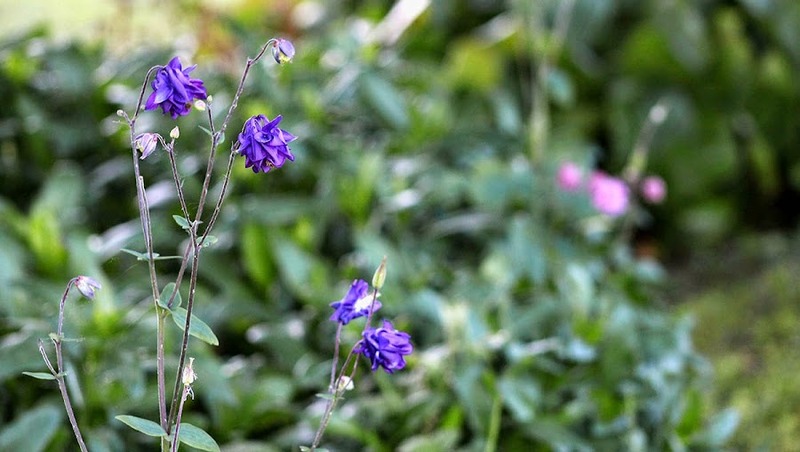 Blue columbine, or ancolies, with a pink one in the background. The weather has gone all rainy at the moment. It's good for the plants, but will interrupt most of our garden work, including planting seeds and setting out the seedlings. This is not unusual. I'm sure there will be several opportunities in the coming week or so to get the vegetable garden in. 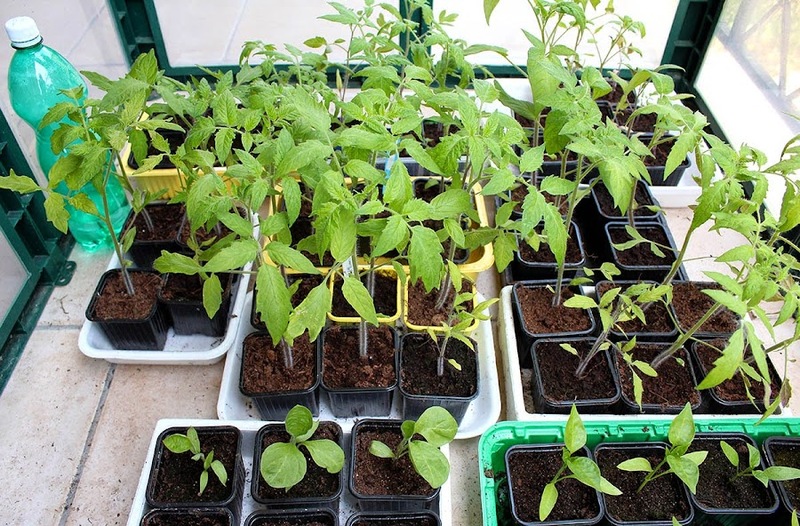 It's time to plant the tomato, pepper, and eggplant seedlings out into the garden. 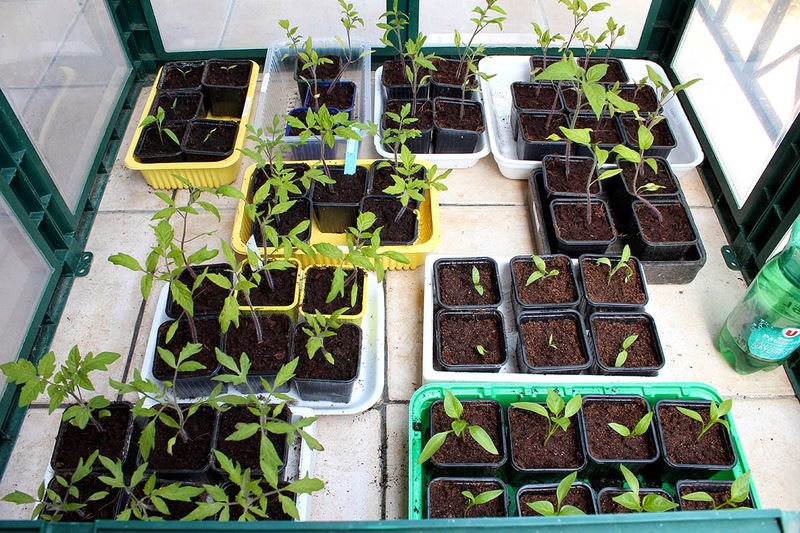 But first I need to harden them off by exposing them to the air and the sun little by little for a week. Here they are on Monday, enjoying fresh air. The eggplants and peppers (on the bottom) are not growing as quickly as I'd like. 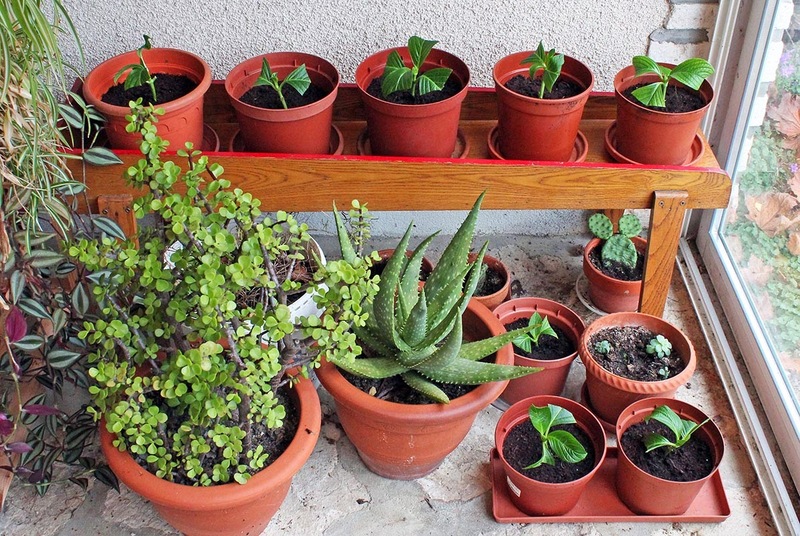 Seedlings on 5 May 2014. They've grown since then! 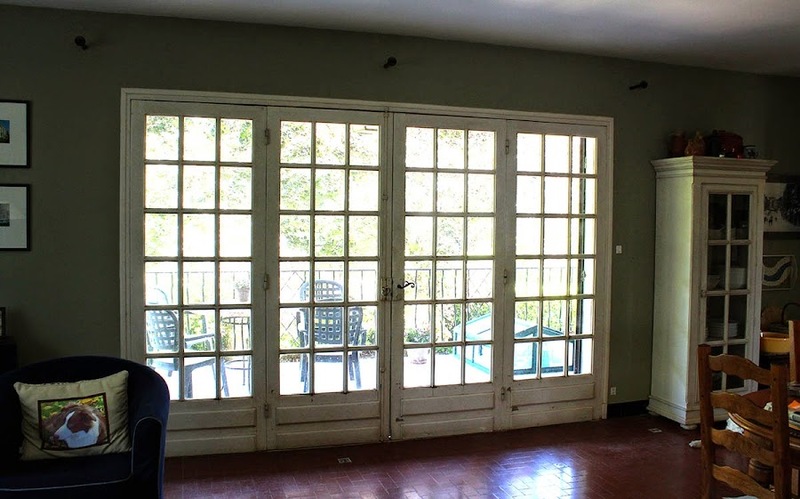 Just in case you haven't seen them, here are some more photos of the new living room windows/doors that were installed on Saturday. We're still liking them, but we've noticed that the center doors may be upside down. We're not at all certain, but the lock shows red when open and green when closed. Getting the room back together with the new windows in place. Something's not right about that. So, we may have to call the installer back to check it out. The new windows are in the photo above, and the old ones are shown below. There was always a lot of light, but now there's even more. 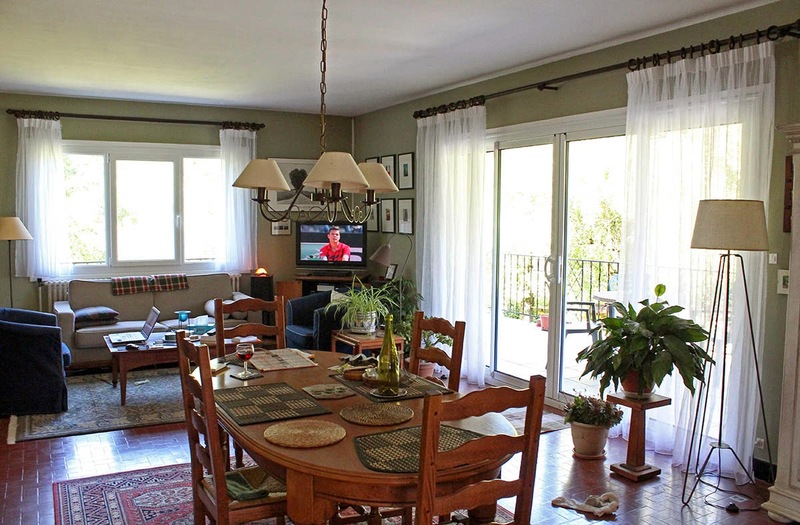 And the unobstructed view without the mullions really brings the outside in. The old doors were nice, but at nearly 50 years old, they had seen better days. Here's a bonus shot from another angle that I think emphasizes the light. It helps that it was very sunny outside. And that I was enjoying some red wine. That's Milos Raonic on tv losing his semi-final match to Djokovic on Saturday in Rome. And I forgot that Callie's play sock was on the floor. Actually, it's been a nice week. Sun and climbing temperatures have made it pleasant to be outside, even if the mornings are on the cool side. 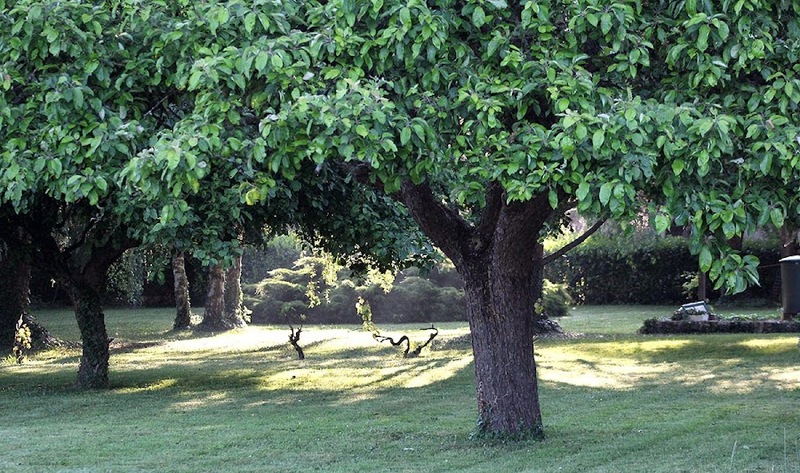 The vineyards are leafing out, cherry and peach trees have set fruit, and it's time to plant the vegetable garden. Our hamlet from out among the vines on a sunny Friday morning. The new doors are installed in the living room. It only took two guys a little under four hours to remove the old doors and install the new ones. 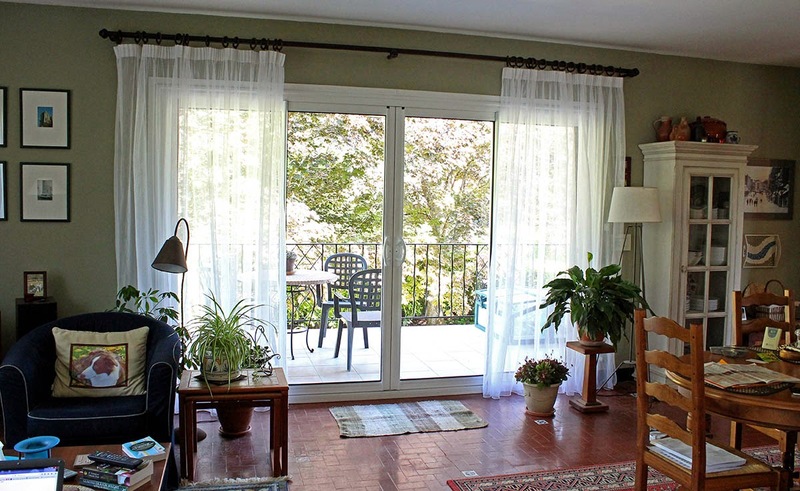 We like them a lot, especially the fact that they're sliding doors and don't open into the room. Ken is posting some photos today; I'll put some up tomorrow. I wonder if these two were aware of each other. I only saw the fly when I took the picture; finding the spider when I looked at the photo on the computer later was a surprise. 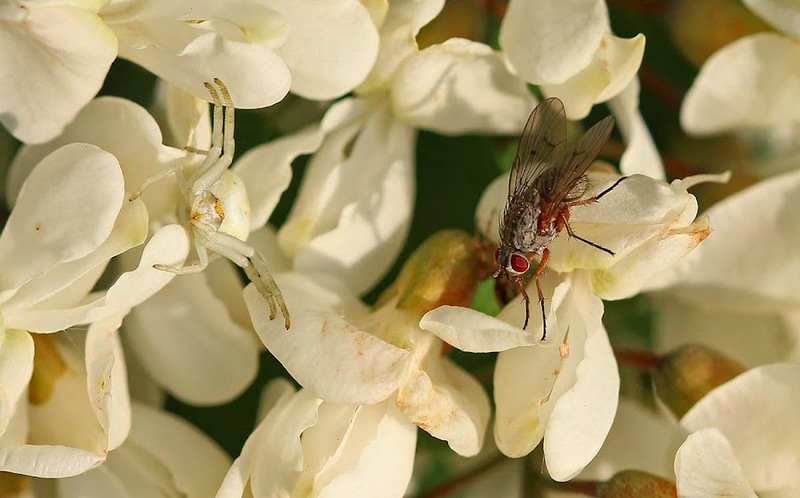 They're both perched on an acacia flower. Today we are getting the living room doors replaced. The installation was postponed two weeks ago when our contractor got sick. He called last week to tell us he's better and is ready to install the new doors. We'll probably have photos between us. 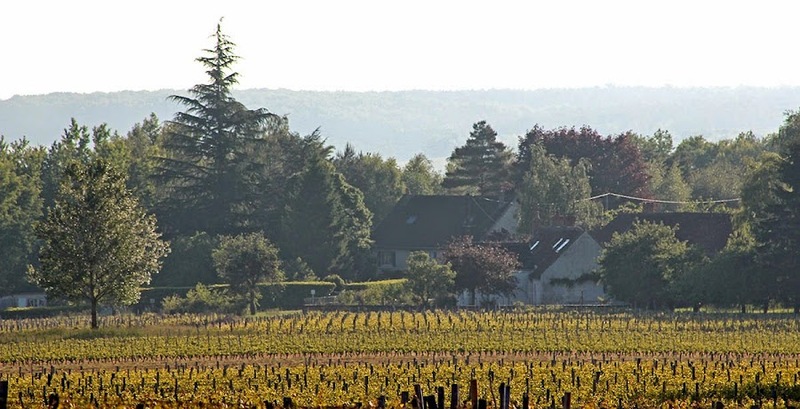 We live in one of the two major asparagus producing regions of France. The other is les Landes, down near the Atlantic coast south of Bordeaux. 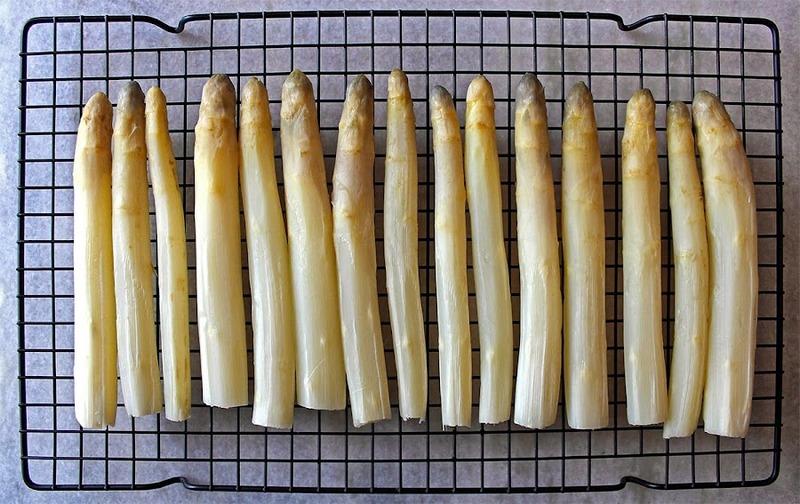 White asparagus is the crop and we enjoy it every spring. It's been available in the markets for a while now, but I usually wait for a few weeks to pass while the price comes down. White asparagus, peeled, trimmed, and cooked, ready for eating. 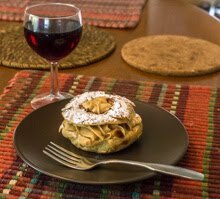 We ate some of these as a side dish the other day, then I used the rest to make my annual asparagus tarte. 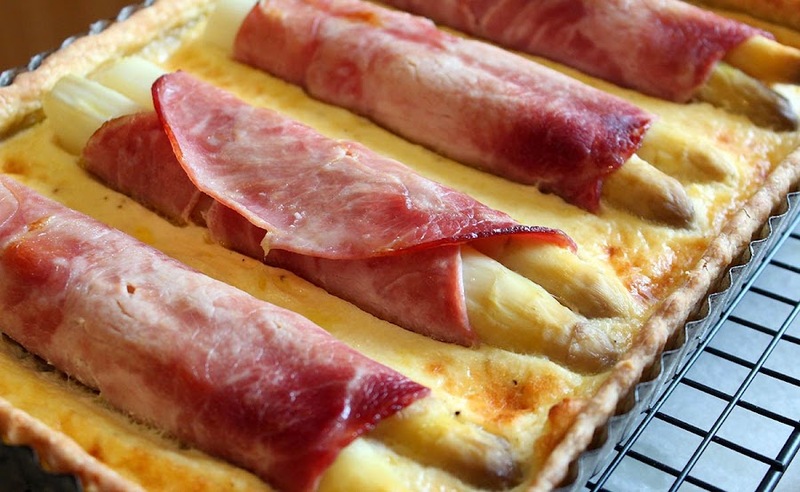 I wrap a few of the spears in a slice of ham and bake the little packets into a cheesy egg custard in a pie shell. Tasty! Here I go again. I think this was taken when I found out what the word "fabulous" means. And it means me. The photographer obviously thought so. Also in this picture are my sister, Laurie, and my brothers, Matthew and Stephen (in the cowboy hat). There are three more brothers and a sister to come. Red was my color. Dig the plastic on the lampshade! The photo is stamped "Mar 69" but it looks, from the presence of Santa Claus, like a Christmas picture. 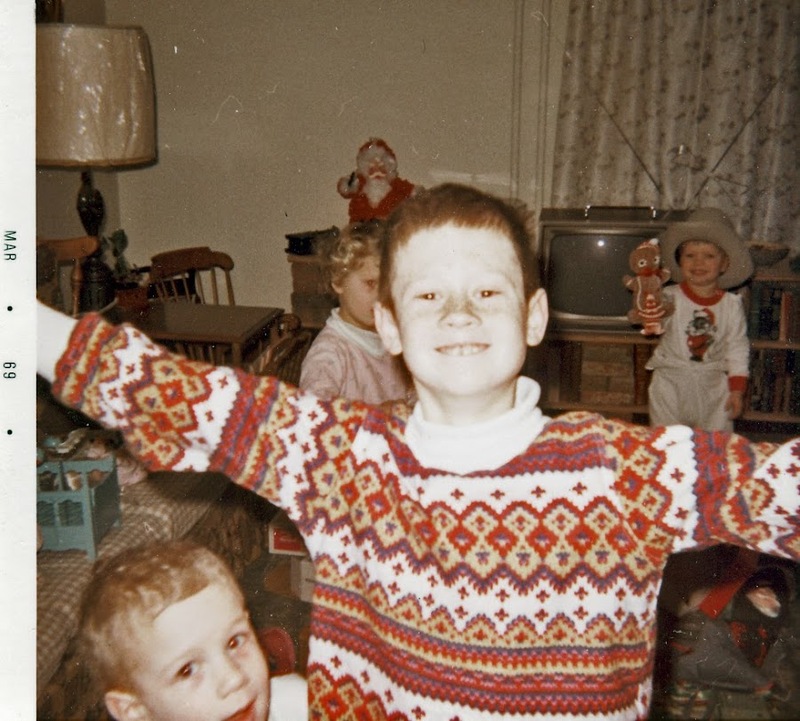 I'm guessing it's from December of 1968, but I'm not at all sure. Either way, I was nine years old. 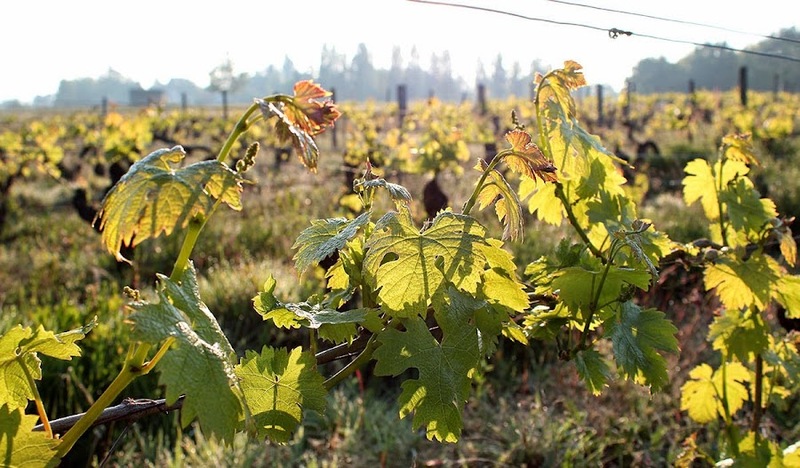 The vineyard is getting greener with each passing day. And there are flower buds, too, a couple of which you can see in the photo. New grape leaves on a sunny morning. I'm planning to plant out the vegetable garden over the next couple of weeks. That means more tilling for Ken (he's a good tiller). I want to try something new (to me) this year: a three sisters garden plot. I will plant sweet corn, beans, and squash in the same square plot. The method is based on native American agriculture developed centuries before European colonization. Corn stalks provide support for the beans, the beans fix nitrogen in the soil, and the squash plants shade the ground to keep in moisture and thwart the growth of weeds. Acacia flowers are opening up all over right now. 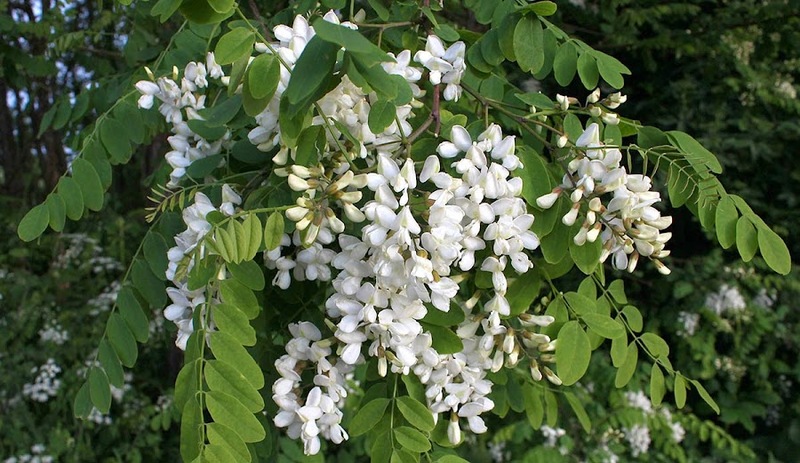 I was out in the car on Monday and noticed huge stands of acacia covered with white flowers along many of the roads around us. Those trees can get really tall. This one is close to home, bordering on one of the vineyard parcels out back. I'm told these are edible, delicious when battered and fried, but I've never eaten them. Our weather is "changeable" right now. Alternating sun and clouds with showers. We had a brief thunder squall yesterday with light hail. Exciting! 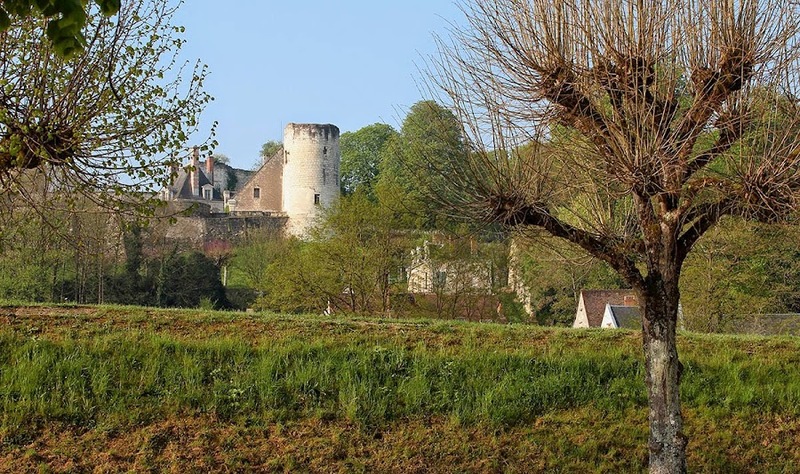 This round tower is probably the most prominent part of the medieval remnants of Saint-Aignan's château. The main building, the part that is lived in, dates from the renaissance a few centuries later. A ninth century tower from the castle's medieval days. We're getting used to the new stove's beeps and buttons and lights. Ken roasted a guinea hen with the rotisserie attachment on Sunday with great success. 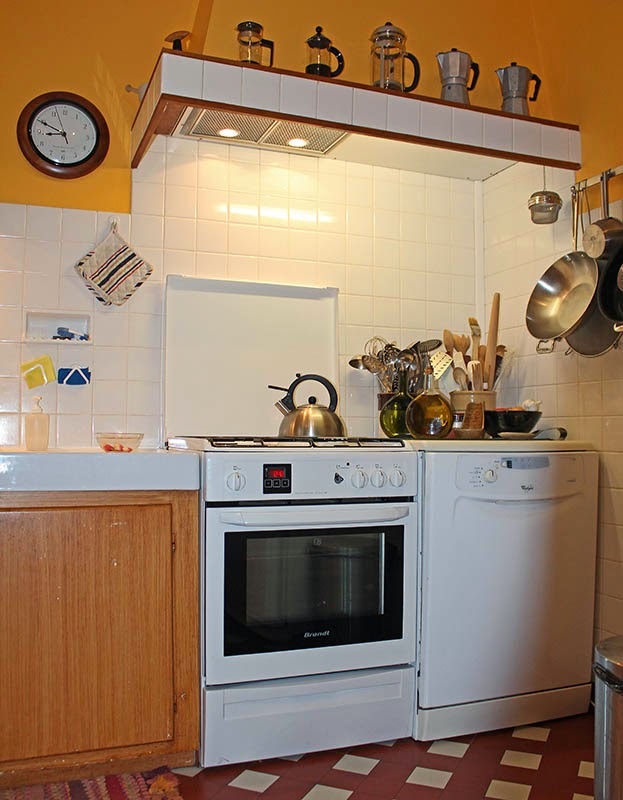 Our new kitchen stove was delivered on Friday. We decided to replace the older stove when the repair guy told us it wasn't worth repairing. That's also when we decided not to buy a replacement from that company. 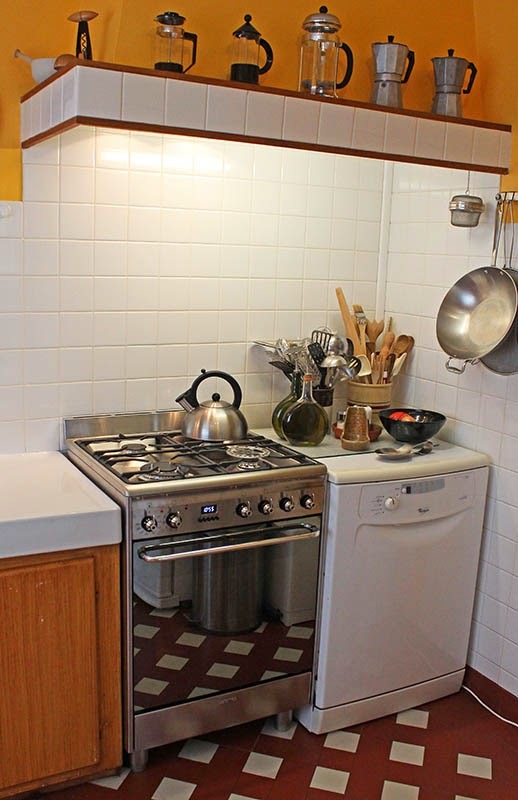 It took us a while to find the stove that had all the features we wanted. So many were close, and we had nearly decided to do without certain features. The new stove finally properly installed. Then, once we decided on this model, two stores had it available for the same price. I tried to buy it from one, but their internet site would not accept my credit card. I tried the second store, but by then the price had increased significantly. So we waited. We went back again to the idea that we'd do without certain features. Then, last week, I looked again at the second store and the price on our first choice had gone back down to where it was earlier. I ordered it, and there was no problem with my credit card (it's the store we've bought appliances from since we got here 11 years ago) and delivery and installation were free, along with them taking away the old stove. The old model looks ok, but one of the burners didn't work and the electronics were screwed up. They delivered the stove on Friday. The delivery guys were, well, delivery guys, and they were a bit arrogant and rough with the stove and kind of threw it together. But it worked. Ken and I had to re-level it on Saturday after replacing the gas hose, which needed to be a little longer (not their fault). All that is now done and the stove is in place and working well. We used it on Saturday, both the burners and the oven, and we like it. So far, so good! Last weekend, our first holiday weekend of three this month, we had a clear morning on Sunday. I counted six hot-air balloons in the sky around us. 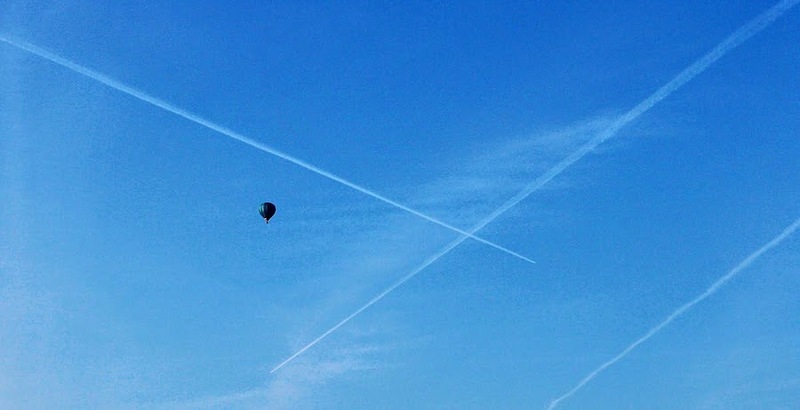 They were all pretty far away, but when I saw this one enter a forming tic-tac-toe board up in the wild blue yonder, I thought a photo was in order. Jetliners create geometry in the sky. The new stove arrived and is installed, mostly. The hose that connects it to the gas bottle is a little short (because the new stove is configured a little differently on the back) and it's not quite level. Today I'll go to the hardware store for a longer gas hose and we will change that out and level the appliance before putting it all back together. So far we like it and plan to use the oven for the first time this weekend. Photos are forthcoming. This is probably not technically a spillway, nor is it a dam. It could be called a weir, but that's not a word we Americans would normally use. In French, it could be called un déversoir or un seuil. In this case, a concrete structure is built across the point at which the Cher River splits around an island. 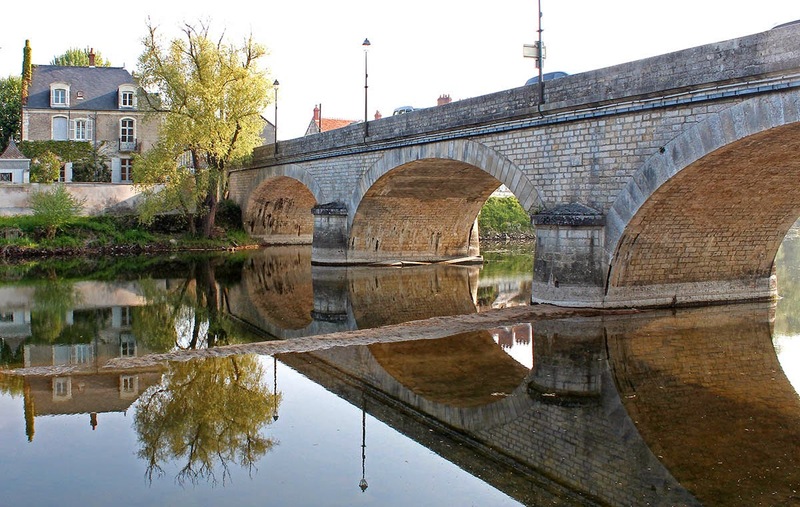 The river's flow is backed up behind a bridge at Saint-Aignan to provide water power to a mill that once stood there. This spillway allows excess water to flow around the island rather than flood lands further upstream. 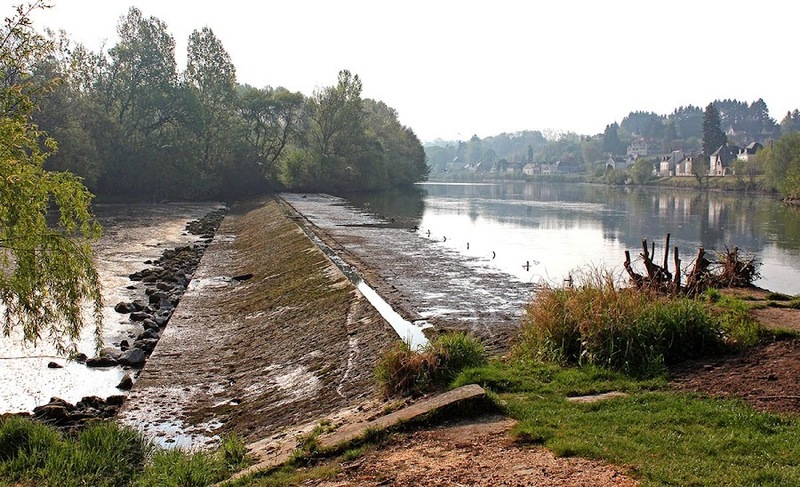 The spillway on the Cher at Saint-Aignan. On this day it was dry. When the river level is low enough that all of its flow passes over the dam at the bridge, the spillway becomes dry and the water in the river's northern channel is shallow and still. When upstream rains cause the water level to rise, it flows over the spillway and rejoins the main channel downstream. I decided to scan some more old photographs and thought I could share some of them in the spirit of Throwback Thursday, the current internet phenomenon. Of course, now that I'm playing along, I'm sure it's passé. Ken took a picture of our home television set when he saw me testifying (a regular part of my job) on the public access channel. I was 40 years old. Fun times. 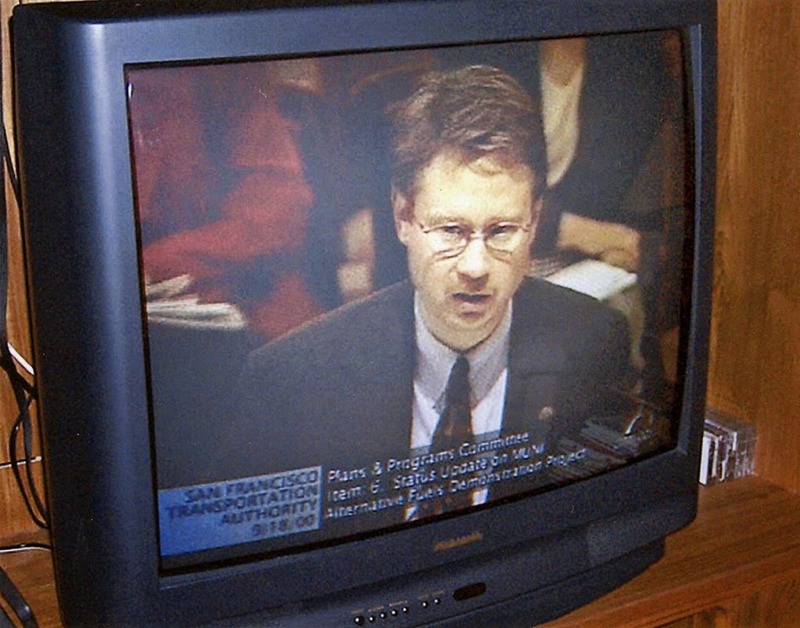 This is me in 2000 doing my job as an executive manager at the San Francisco Municipal Railway, defending our management decisions before a committee of the city council. I took a lot of lumps for this one, but I still believe we were right. Just not politically correct for the time. And that's not good when you're working with politicians. File this one under "Who Knew?" I certainly didn't. I've been growing oregano for years, but never really enjoyed it in cooking. No flavor. Then, recently, I read that oregano only really develops its flavor when it's dried. So I researched drying methods and found that it's very easy to do in the oven. 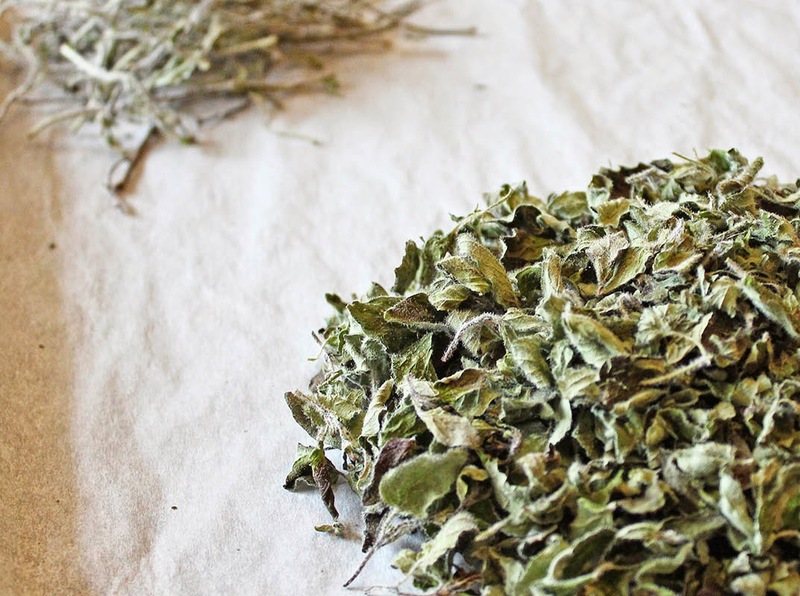 The first of three trays of dried oregano, separated from the stems and ready to go into a jar. I cut a whole bunch of oregano from my garden, then washed and dried it (in a salad spinner). I spread the fresh herbs on three cookie sheets lined with parchment paper and put them into the oven at 55ºC (about 130ºF) for a few hours. They dried out very nicely without burning. Then I slid them off the stems and put the finished herbs into a jar. It smells great and I can't wait to use it. We got a lot accomplished on Monday, taking advantage of the warm, sunny day. Ken tilled up a couple of the vegetable garden plots in preparation for planting later this month. I hauled off the remaining trimmings from the forsythia shrubs, dug up the flower bed in front of the garden shed, and cut all the grass. My limbs are sore this morning. The northern span of the bridge over the Cher at Saint-Aignan. I also bought a stove. It's the one model we found that has all the features we wanted and it's scheduled to be delivered on Friday. I'll take pictures then. Or, how does my garden grow? This is the beginning of this year's vegetable garden. I planted tomato, pepper, and eggplant seeds back in March. They take a long time to get going, especially the eggplant and peppers. 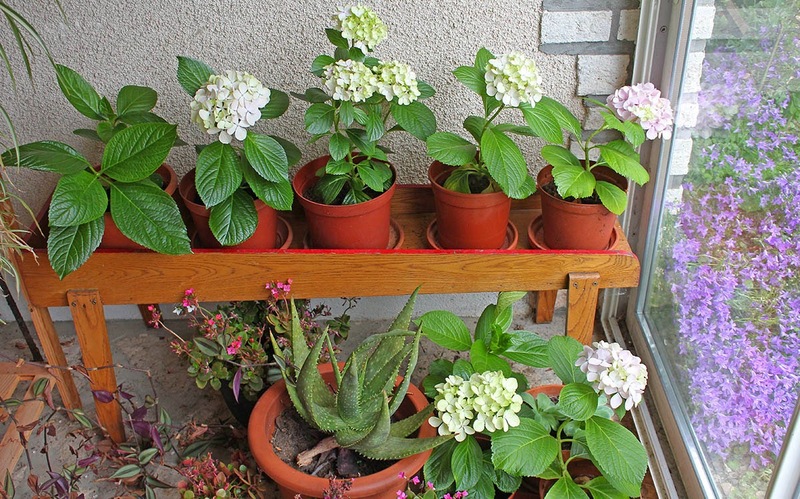 I put three seeds of each variety into each of several pots and kept them warm and watered in the house. Most of the seeds sprouted, even though many of them were older seeds and past their prime. I was happy about that. Inside the mini-greenhouse. Jalapeño peppers in the upper left, then lots of tomatoes, with eggplant and bell peppers in the lower right. They've been out on the deck under the mini-greenhouse since the beginning of April. I spent this past week dividing the sprouts and putting them into individual pots. I'm going to give them three more weeks in the mini-greenhouse to grow good roots and harden them off before transplanting them once again into the garden. As ususal, I have too many tomatoes. There are seven different varieties, one variety in each of the trays you see in the photo. I count a total of 36 tomato plants. I'll see how many of each finally fit into the garden. I will also be planting summer and winter squash, corn, cucumber, and bean seeds in late May. Space is limited! I'll keep you posted. This is an oldie, but one of my favorite photos. 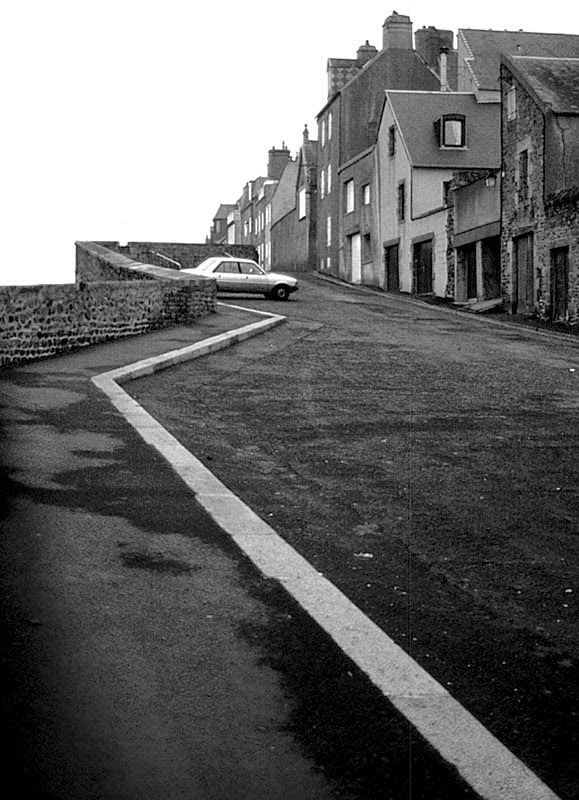 I took this picture in 1992 during a road trip with Ken through Normandy and Brittany. It's the city of Granville on the Normandy coast. The original photograph was a color slide, probably Fujichrome. I scanned it and converted it to a black-and-white image about seven years ago. I've since reprocessed the original scan; the result is what you see here. I think it looks a little better now. Except, of course, for the vertical scratch that's visible on the lower half of the slide. My old Pentax camera started scratching the film for some reason. I have hundreds of slides with the same scratch through them. I could remove the scratch with Photoshop, but I decided not to do it today. 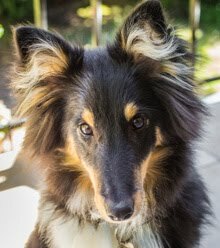 I'm ready for my close-up. 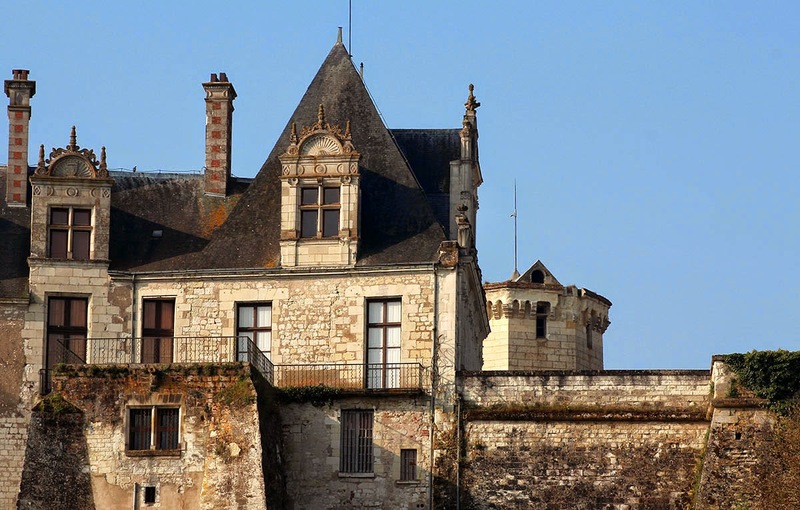 If Saint-Aignan's château were Nora Desmond. So here is the close-up. It's the western end of the Renaissance wing, seen with the telephoto lens from the island in the river. But I'm sure you already knew that. The detail on the upper windows is amazing. It looks like we're coming out of a rainy period. I'm not going to get the grass cut today, but I am thinking that Monday will work. By the way, I'm playing along with Jim's A-Pic-A-Day-In-May challenge. It's not really a challenge for me since I post a picture a day anyway. But still. Check his blog out if you get a chance! The pink color on some of these trees' bark is very subtle and I'm not sure this photo does it justice. Seen against the intense green of new spring growth, it's very pretty. This is another shot taken down along the riverbank. 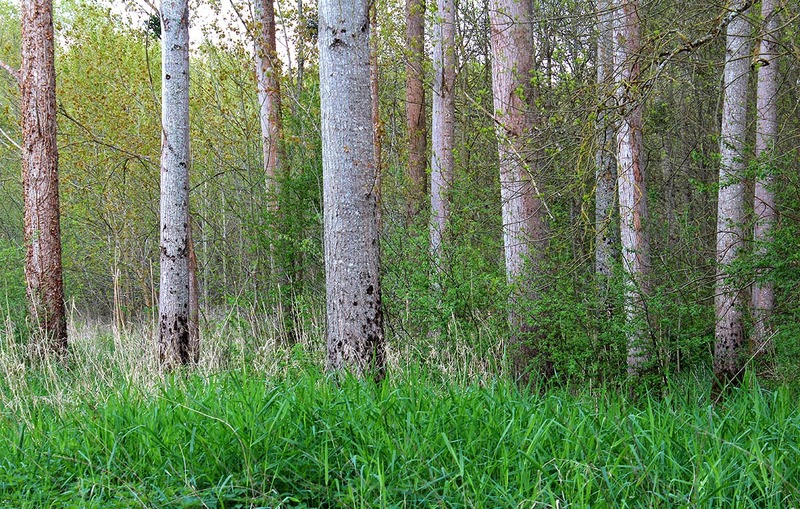 A stand of tall, straight trees near the river. The weather has been rainy for a while now. We had quite a lot on Tuesday, over twenty-five millimeters (more than an inch) added to the fifteen mm we got over the weekend. I'm waiting now for a few dry days in a row so that I can get the grass cut again. Maybe on Saturday. This is me in 1989. Ken and I did a drive trip through southwestern France and we had stumbled upon the ruins of a gallo-roman amphitheater in the town of Saintes. 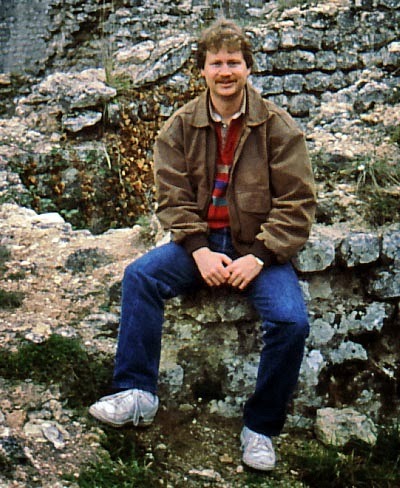 I was in my first semester of graduate school at Berkeley and was really into roman ruins. Me at 29, very close to 30. Not a grey hair on my head. Yet. I still wear that shirt. And I still have that jacket. The jeans, not so much.